something ive never heard before so it must be from Third Stage. thanks in part to a home run by the elderly pitcher, greg maddux, who is still on the mound. thanks sox. did you drive your cah to tha pahk? if i could be anywhere in the world it would be wrigley this weekend. the last time the red sox were at wrigley was for the 1918 world series. little known fact but that series wasnt played at fenway and wrigley, it was played at fenway and comiskey because back then people didnt have television so they figured more people could attend the games if it was held on the south side, so thats what they did. 1918 was the last year that the sox had won the world series until they did it again last year. its 1:33 and twenty minutes with tony starts a-now. chris chelios and some dude with a red sox hat just sang take me out to the ballgame. 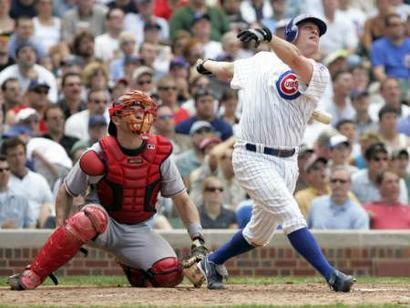 one of the great things about baseball is if you take your hacks the pitcher actually can hit a homer. cubs just banged two doubles in a row. oh this is sweet. i really dont like interleague play. its like if people said guys can walk around with their dicks out. you’d say, yeah i guess thats interesting, but after a few years ive had enough. even though the cubs just hit another double i like that the sox havent played in 85 years. its what used to seperate baseball from any other american sport. teams just did not play each other unless it was a world series situation, and with so many teams nowadays, other than filling the coffers of the owners, i dont see the point of this any longer. it also sets up situations like the fact that the cubs play three games here in LA and not again all year. it sorta weakens league rivalries if you ask me. last night big time red sox fan karisa invited me over for dinner to celebrate the eve of this historic meeting. i just called her because she doesnt get wgn in her hollywoodhills penthouse. 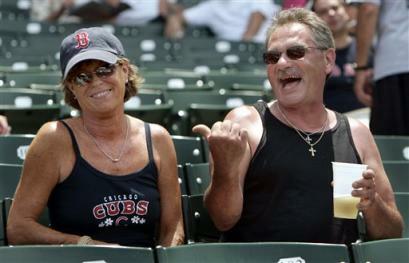 hey its 14-3, i told her, tell your girlfriends they can come to wrigley whenever they want. she made shrimp linguine, we ate garlic bread, and drank wine. may i say i was a little shocked to see her get drunk so quickly, i thought she had been practicing pretty well over the last few months, but then again she is a girl, which shouldnt be hard to remember but sometimes it is. the cubs finally got out of the inning and wgn is playing “more than a feeling” into the commercials and this is the way to wake up. fucked up at 8am and called the court to see if they would pick me on my last day of jury duty and indeed they had! i was supposed to call in last night but between doing laundry and hanging out with karisa i had forgotten to call. so at 8am i woke up when someone else called me and i called the court and the happiest man in the planet laughed and said oh dont worry, you can call every day next week then. d’oh! ok that ends twenty minutes with tony, come back next time when we discuss how great it is to park right in front of my house.